Today I went on a number of errands, including to our nearby model train store to pick up a boxcar Dave ordered, and to the local large children’s consignment sale that’s wrapping up this weekend. 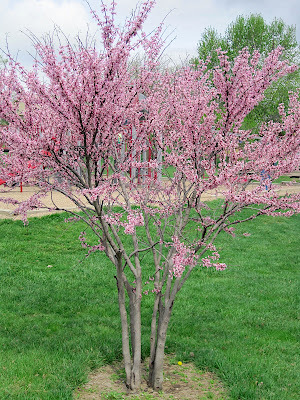 I decided to grab my camera and capture some of the pretty trees that are gracing eastern Nebraska right now. I’m not sure why I didn’t notice these last year — it could be that I was just coming home from my deployment at this time a year ago…and my mind was on other things, like looking at how much my little boys had grown instead of at the blooming trees. 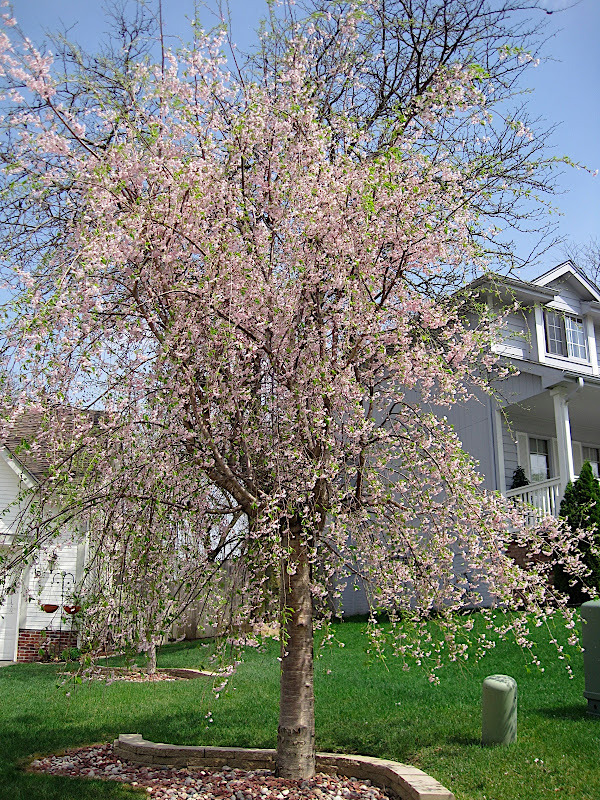 Anyway, I’m definitely now noticing these pretty trees throughout Eastern Nebraska, and I spent several minutes this afternoon photographing assorted trees in our neighborhood, and then later today I was busy uploading the pictures and investigating what kinds of trees I photographed. I’m no professional photographer, I just wanted to capture some memories of these pretty trees, we don’t plan to be in Nebraska forever. Really…we won’t. We really like it here, but I’m afraid we don’t LOVE it here. We LOVE Pennsylvania…we LOVE North Carolina…we really really really LIKE Florida. But that’s for another topic…. After the tree in my own yard, I drove over to the next block, where there were some pretty trees that reminded me of my college days. 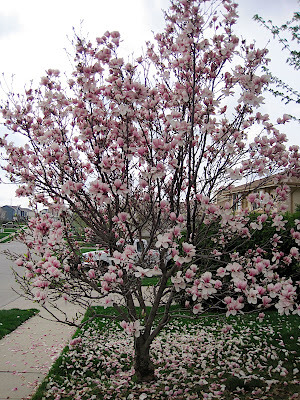 In front of my dorm building were similar trees, that bloomed just as we were cramming for finals! 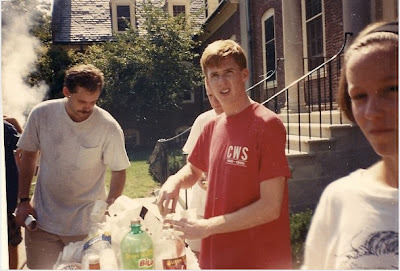 You can see the referenced tree behind these folks barbecuing in August 1991, but since this picture was taken in the summertime, it’s well beyond blooming. Pardon the confused-looking tailgaters. I vaguely remembered that the tree in front of Irvin Hall was a member of the magnolia family (it was nice having a Forestry major for a roommate my Junior and Senior years). Upon further checking, I learned that I had captured two kinds of magnolia trees today…a Jane Magnolia (pink) and a Star Magnolia (lighter pink…almost white). 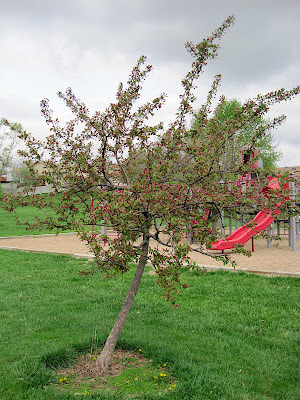 Next on our little trip was to the neighborhood park, where we had a great variety of flowering trees — 3 kinds: redbud , some sort of apple or pear blossom tree, and a crabapple tree . 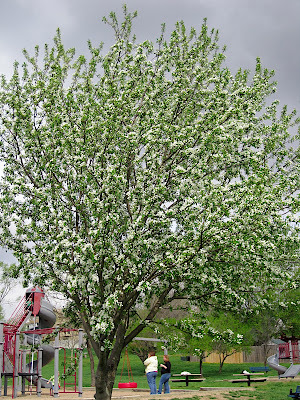 I’m having a hard time telling pear from apple blossoms so I could be wrong here with the white flowers. Then I headed up the road towards my errands, and I knew there were some bright yellow shrubs that I wanted to photograph. For some reason I was thinking they were goldenrod, which is Nebraska’s state flower. I took these pictures all along thinking they were goldenrod, but I was wrong, they’re actually forsythia. I remember seeing forsythia everywhere in Korea in the springtime…pretty. Fascinating fact: forsythia can produce its own lactose. Before our errands, Timmy and I had lunch at Culver’s, which is a local fast-food/frozen custard chain. 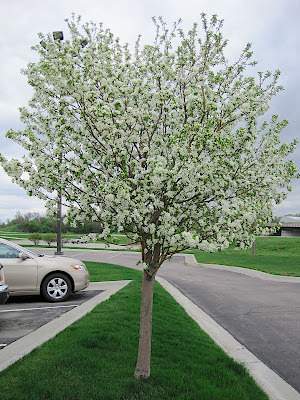 I caught some pictures in the parking lot of their pretty flowering tree: I think it’s an apple tree of some sort, but I could be wrong.